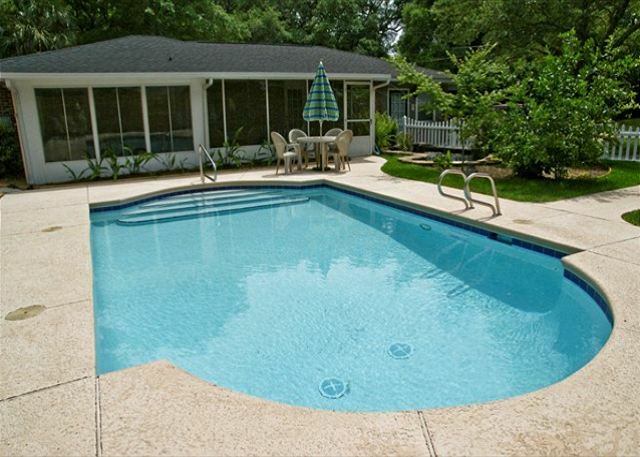 Freshly remodeled cottage with four bedrooms, 3 baths a new swimming pool, garden pond. WiFi internet access, TVs in all bedrooms, 42" TV in LR. Handicapped accessible. Located near beach, stores and lots of walking and biking places. PET FEE is $ 100 Occupancy 10. Real Escapes Properties offers this island original! This single level home has 4 bedrooms and 3 baths. There are TV's in all bedrooms. There is a private pool which sits in the side the fenced back yard. This is definitely not the fanciest home on Saint Simons but it is comfortable and everything you need for a family vacation. The pool makes this house! 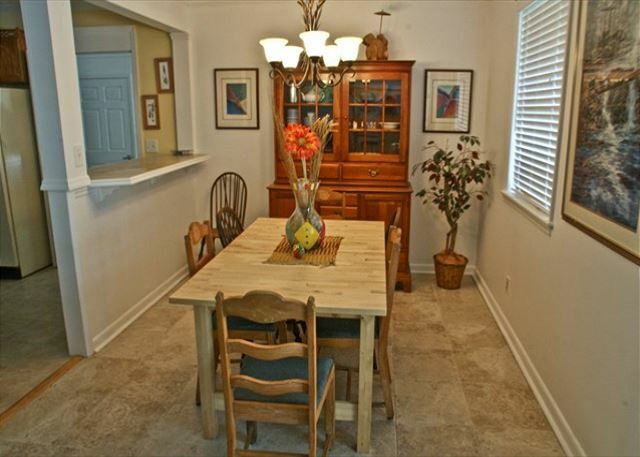 It’s a great size and there is plenty of space in the house plus a well equipped kitchen. A great foundation for a positive experience on St. Simons. Our family is in the third generation of vacationing at St. Simons every summer. We always rent and naturally as the family grows so do our requirements! Citrus Cottage perfectly accomodates children, adults, dog, swimming pool and very quick access to beach. The house is clean, private, well maintained and enough space where no one is ever under foot - but yet there is quick access to all areas. This is our third year in Citrus Cottage and our grand children do not want to stay anywhere else. Location was very handy and easy to get too. This house was perfect for my family. Quiet, clean and had everything we needed. The decor is very dated and the house could use some general maintenance so don't expect a luxury stay, but if you are looking for a relaxing time with your family it is perfect. We enjoyed it. Cottage needs a few updates but it is nice and in a great location. We had a great stay except for the roaches. The first 2 days we killed a dozen very large roaches. We reported it to the management company and they immediately sent pest control. Unfortunately, the service came a second time and woke us all up then proceeded to have 5 people in and out of the house for the entire day. I realize the problem had to be addressed but it should have been done when it was unoccupied. Whatever they did obviously worked because we woke up every day after that to DOZENS of dead roaches everywhere. The only other issues were very old pillows, only 4 wash clothes and the concern that the house has had all of the smoke detectors removed. The beds were very comfortable and the kitchen was well stocked. Pool and backyard are beautiful. I am sure we will choose to rent this house again. We enjoyed our stay at citrus cottage! The pool is amazing and it's only minutes to the beach. We enjoyed our stay! The pool was wonderful and the house was in a location that was convenient to the beach and restaurants. We are looking forward to returning again soon!